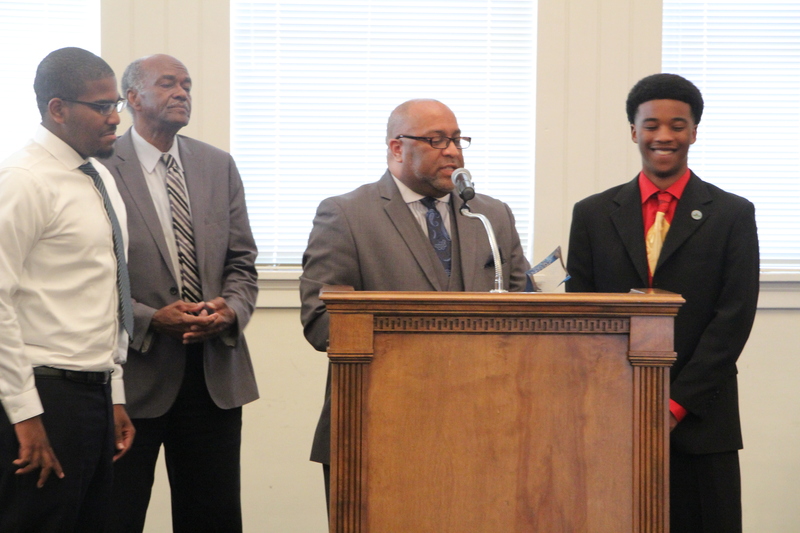 At the June 7 Commission Meeting, Macon-Bibb County named and honored the 2015-2016 recipient of the Bert Bivins, III Student Leadership Award, which is given to a member of Macon-Bibb’s Georgia Civic Awareness Program for Students (GCAPS) cohort. This year’s recipient is Sharrieff Muhammad, a recent graduate of the Georgia Cyber Academy and the first homeschool student to participate in the program. He had the privilege to represent Macon-Bibb at the 2016 National League of Cities Conference in Nashville, Tennessee. Mr. Muhammad enjoys soccer and plans to study broadcast journalism. To see pictures from the recognition, click here. The Award is named to honor Mayor Pro Tem Bivins, who helped start the program when he was a Commissioner for the former Bibb County government. The 2014-2015 recipient was Sherrod Hollingshed – now a sophomore at Georgia Southern University – and he was on hand to present Mr. Muhammad with his award. For the past three years, Bibb County (and now Macon-Bibb County) has participated in the Association County Commissioners of Georgia’s (ACCG) Georgia Civic Awareness Program for Students (GCAPS). More than 100 students from Bibb County public and private schools applied for this year’s cohort, and more than 30 were selected through a rigorous application and interview process to participate. Students in the Macon-Bibb GCAPS cohort get to see how government works, what’s changing through consolidation, and how they can be involved with and improve the community now and in the future. Throughout the course of the year, students take part in team-building exercises, attend Commission meetings, tour county facilities, visit the State Capitol, and interact with local and state leaders. Pictures from their visits can be seen on their Facebook page, and MaconBibbTV produced a feature video on their trip to the Gold Dome and Suwanee.